After a long period of not having issues with Citrix, this old chestnut popped up again. I checked back and we had this one before way back in 2012. 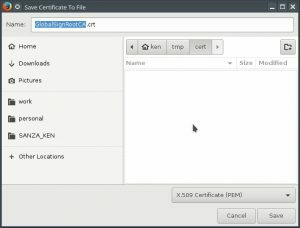 The problem is that the cert is not in the plugin directory that wfica uses. So the solution is to get it and put it in the correct place. 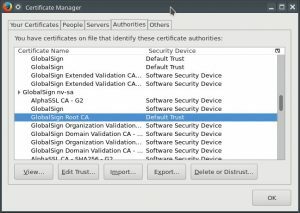 At the time Firefox had removed the option to export certificates but fortunately it has bee restored. 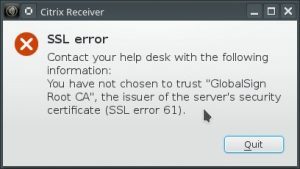 Scroll down and click on “GlobalSign Root CA” (under GlobalSign nv-sa), and then press Export. Then copy it into the correct directory. Thanks very much for this fix. I had this immediately after downloading a new installation of Citrix Receiver via our company’s NetScaler. Step two: If you’re doing this to access some random-@#$ win32 executable that should have been replaced by some software from the current millenium, just get it over with right now and throw yourself out the window, trust me; it’s not going to get better!